Wednesday 21. September 2016 - Electronics For Imaging, Inc. (Nasdaq:EFII) announced today the launch of a new EFI Fiery digital front end (DFE) for the Kyocera TASKalfa MFP lineup targeted to busy office workgroups. The new Fiery Printing System 15 for Kyocera TASKalfa MFPs offers great color and image quality, along with optional tools for automated job submission. Customers can expand their capabilities for personalized printing using the integrated variable data printing (VDP) capabilities of Fiery FreeForm. Optional Fiery Hot Folder and Virtual Printer features can reduce errors and automate repetitive tasks for all office workers. Impressive performance: The new Fiery DFE comes with Fiery SmartRIP technology, which quickly and easily processes even complex, content- and image-rich files by intelligently streamlining the processing of queued jobs. This gives users the performance and speed to process and produce professional-looking booklets, brochures, manuals, and flyers in-house and on demand, at a fraction of the cost to outsource. Superior color quality: The Fiery Printing System delivers high-quality color and images right out of the box, and offers tools to achieve even more advanced color quality. Companies can use Fiery Spot-On for color-critical jobs to ensure brand colors are reproduced correctly and to achieve the best match for PANTONE colors. Easy-to-use desktop printing: The Fiery DFE is certified for Fiery VUE, a visual, interactive desktop printing application to easily create professional-looking print materials such as booklets, sales guides, and manuals in a few clicks. Fiery VUE provides an instant 3D preview of the finished product. It can be used for producing professionally finished documents on-demand without the cost and long lead times of outsourcing. Customers can download Fiery VUE for free at www.efi.com/fieryvue. Booklets with just a few clicks: Fiery Booklet Maker is a driver-based imposition tool that allows users to print multiple pages of a print job from any application in a booklet style without the need for more advanced imposition programs. Users can intuitively navigate and select the appropriate booklet type and options for the job through a wizard-type workflow. Extended job processing capabilities: The optional Fiery Productivity Package offers a set of tools that enable last-minute image corrections, advanced queue management functionality, and automated job submission and preparation. 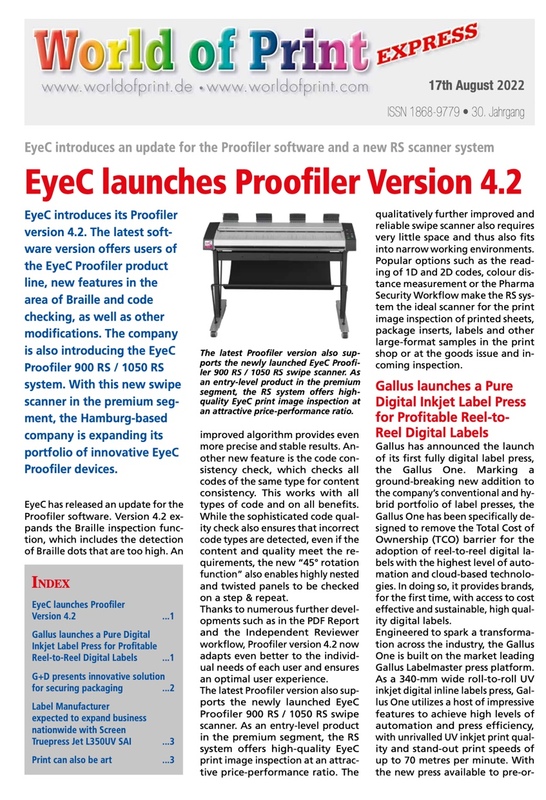 “Based on the latest FS200 system software, this new Fiery DFE gives office users improved performance capabilities with speed enhancements, easy-to-use applications to produce professional-looking print materials, and the ability to save time and money by keeping jobs in-house with tools to automate job submission and enable last-minute image corrections,” said John Henze, vice president, Fiery marketing, EFI.